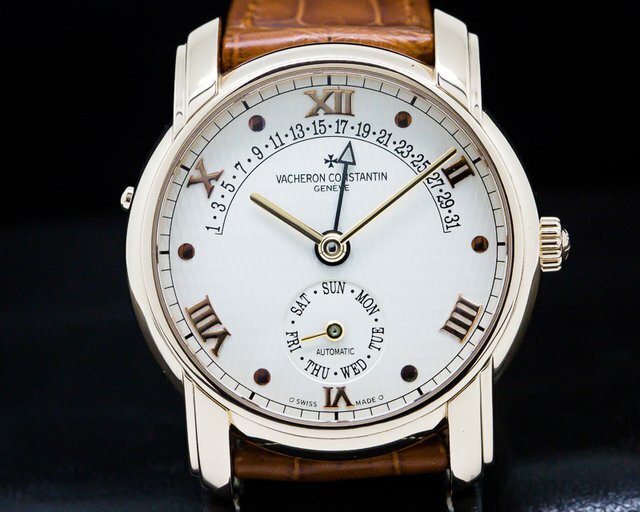 Below is our current in stock inventory of Vacheron Constantin watches. 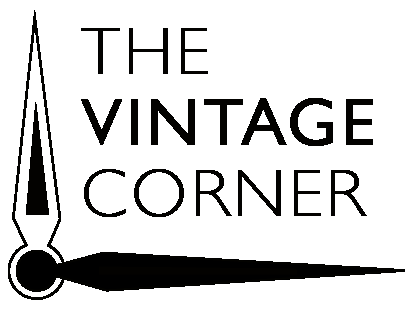 If you have a Vacheron Constantin watch you are interested in selling or trading please contact us. 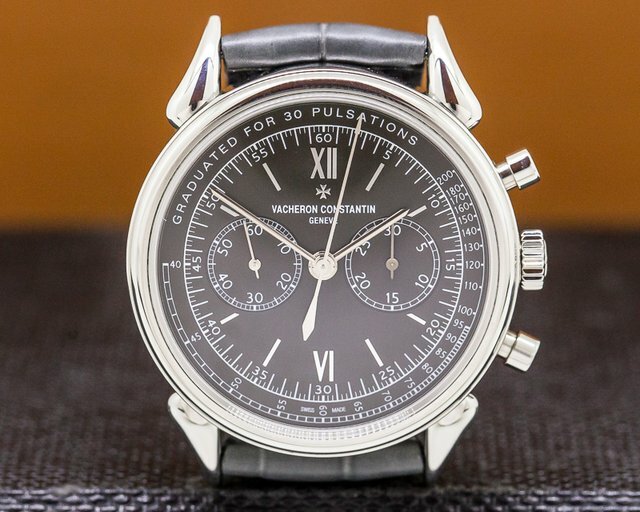 29372 Vacheron & Constantin 47051 Triple Date, 47051/000G-8759, 47051000G8759, 18K White Gold case on an alligator strap, automatic movement, caliber. 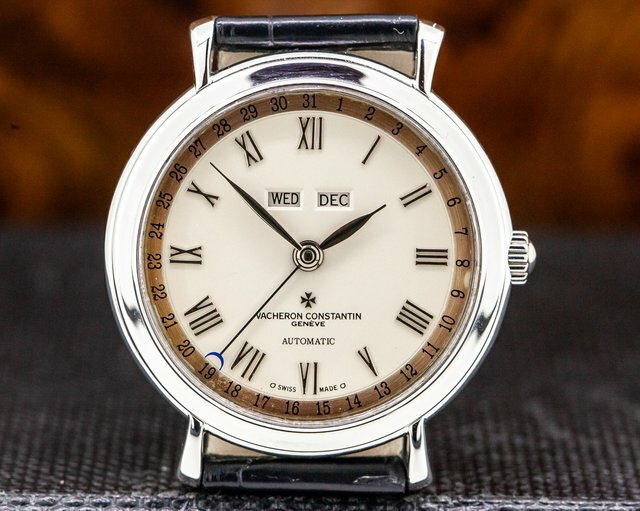 1126, case, dial and movement signed, silver dial with applied gold Roman numerals, the outer ring has developed a beautiful patina, day, date, month, white gold baton hands, 36 Jewels, movement adjusted heat & cold isochronism and 5 Positions, diameter: 36mm, thickness: 10.5mm, sapphire crystal, water resistant. Like New with Box. This watch was just fully serviced. 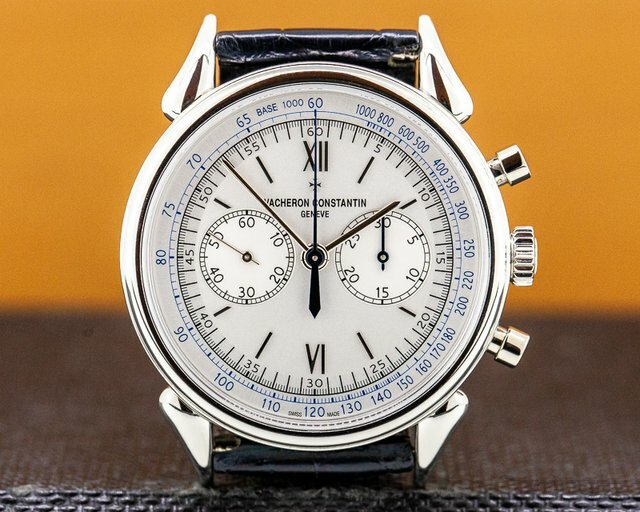 30556 Vacheron 5000H Les Historiques 1955 Cornes de Vache Chronograph Limited Edition for Hodinkee, 5000H/000A, 5000H000A, limited to 36 pieces, stainless stell on a strap with a stainless steel tang buckle, manual wind VC caliber 1142, chronograph, small seconds at 9 O'Clock, anthracite gray dial with applied hour markers, pulsation scale, display back, sapphire crystal, size 38.5mm, thickness: 10.9mm, sapphire crystal, water resistant, like new with box, additional Hodinkee straps, and papers dated February 2017. 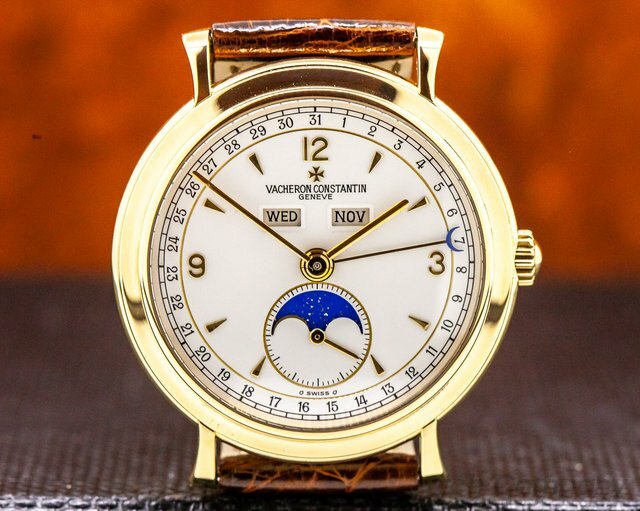 31117 Vacheron & Constantin 47245 Patrimony 31 Day Retrograde 18K Rose Gold, 47245/000R, 18k Rose Gold on a strap with an 18k Rose Gold buckle, automatic movement, caliber 1126/1, 36 jewels, retrograde date, day, textured silver with applied Rose Gold Roman numerals and round indexes, display back, sapphire crystal, water resistant to 3 atm, size: 37 mm, thickness: 10.1mm, Like New with original box and instructions. This watch was just fully serviced. 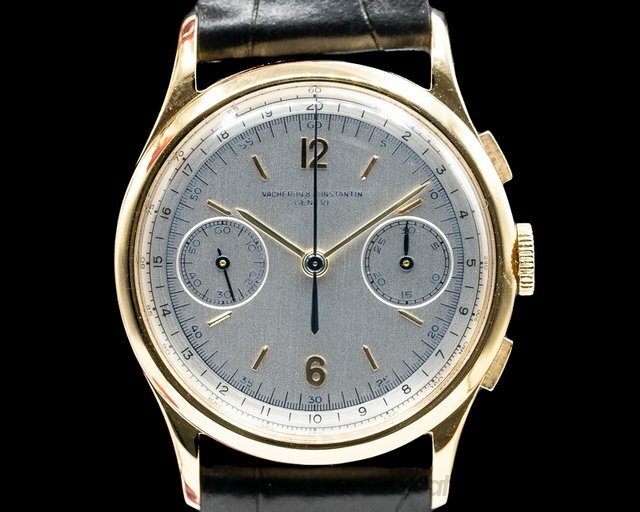 30546 Vacheron Les Historiques 1955 Cornes de Vache Chronograph, 5000H/000P, 5000H000P, Platinum on a strap with a Platinum tang buckle, manual wind VC caliber 1142, chronograph, small seconds at 9 o'clock, opaline white dial with applied hour markers, pulsation scale, display back, sapphire crystal, size 38.5mm, thickness: 10.9mm, sapphire crystal, water resistant. Like New with original box and papers dated 1/2016. 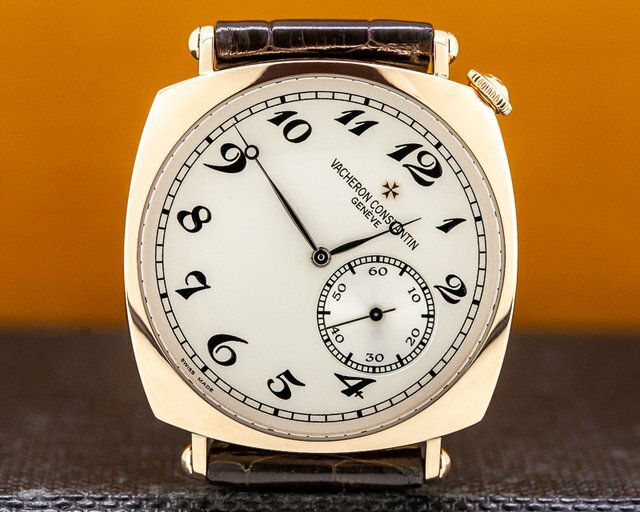 30682 Vacheron Constantin 82035/000R-9359 Historiques American 1921, 82035/000R, 82035000R9359, 18K rose gold cushion shaped case with an 18K rose gold tang buckle, manual wind Vacheron Constantin Calibre 4400 movement, 65-hour power reserve, crown at 1:30 position, silver dial with black Arabic numerals, sapphire crystal, display back, water resistant, size: 40mm, thickness: 8mm, like new with original box and papers dated July 2010.